Avoid soggy textbooks and water-logged gadgets with the Rambler Backpack, a 10-gallon waterproof bag. From San Francisco-based Mission Workshop, the Rambler contains two weatherproof compartments with water-resistant urethane coated zippers, an external accessories pocket and an expanding cargo compartment. Hoist it onto your shoulders in the rain for a worry-free trip to class. It's even got a lifetime guarantee. Keep your bag organized with a Grid It! 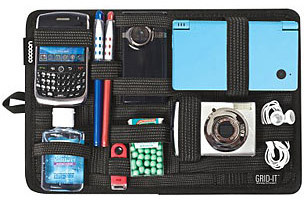 Organizer  a woven elastic pad that provides a place to tuck any device. The elastic holds things firmly in place, while the 12-inch by 8-inch pad slips nicely into your bag, alleviating those frustrating minutes of digging around for your phone.